As summer begins and farmer markets open, peppers will become more and more available. The colors are so wonderful and the flavor so fresh! 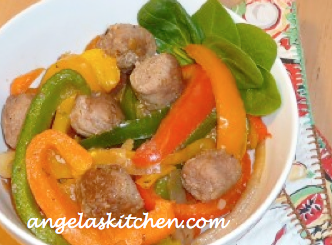 Gluten & Dairy Free Sausage and Peppers pulls together very easily, yet packs a big punch of summer flavor for you to enjoy. Our family likes Sausage and Peppers served on it’s own with a salad, or over baked sweet potatoes, rice, quinoa, polenta or gluten free noodles. Sausage and Peppers also makes a great dinner sandwich when served on grilled or toasted gluten and dairy free buns (such as Noah’s Rolls). The recipe is slightly different than the one posted on Simply Gluten Free to be more in keeping with how I make it for my family and to add freezer instructions so I can have this on hand whenever we are ready for a nibble. Enjoy! Slice the sausage after first removing their casings, if needed. Heat olive oil in a large skillet, add sausage and brown sausage pieces. Remove from the heat and set aside. Using the oil/sausage drippings, add the onions to the hot pan, stirring to coat. Season with salt and pepper. Cook until the onions have started caramelizing and softening. Add sliced peppers and Italian seasoning, cooking until the peppers softened. Return the sausage to the pan and add the garlic and chicken broth, cooking until the sausage has heated through and the liquid has reduced. Adjust seasoning with more salt and pepper if needed. Freezing Directions: Allow to cool. Divide into lunch sized portions in freezer safe containers or place entire amount into a gallon sized freezer bag for another meal. Remove as much air as possible, seal, label and freeze. To Serve: Thaw. Heat through.